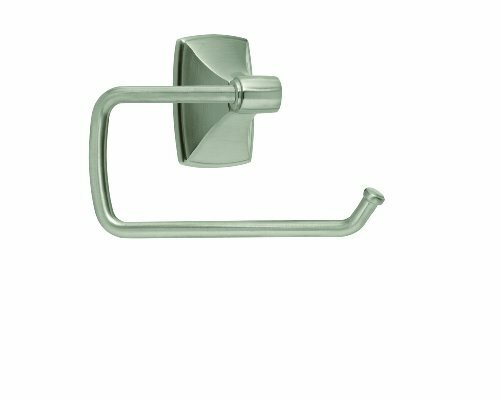 The Amerock BH26500G10 Clarendon Single Post Tissue Roll Holder is finished in Satin Nickel. An updated twist on traditional aesthetics inspires this sculpted collection. Featuring an artful design with smooth structural transitions, Clarendon effortlessly coordinates with Amerock's Candler and Extensity decorative cabinet hardware collections to transform any bath into a relaxing spa. The classic Satin Nickel finish provides a sleek, lightly brushed, warm grey metallic look. Amerock offers a complete line of decorative and functional cabinet hardware, bath hardware, hook and rail and wall plates. Amerock’s award-winning decorative and functional hardware solutions have built the company’s reputation for chic design accessories that inspire homeowners to express their personal style. Available in a variety of finishes and styles, Amerock offers high quality designs at affordable prices. Always Creating. Always Timeless. Always Amerock. View More In Toilet Paper Holders. If you have any questions about this product by Amerock, contact us by completing and submitting the form below. If you are looking for a specif part number, please include it with your message.